I love salmon as many of you know it is my favorite fish. This is so refreshing . Simple and easy to prepare. 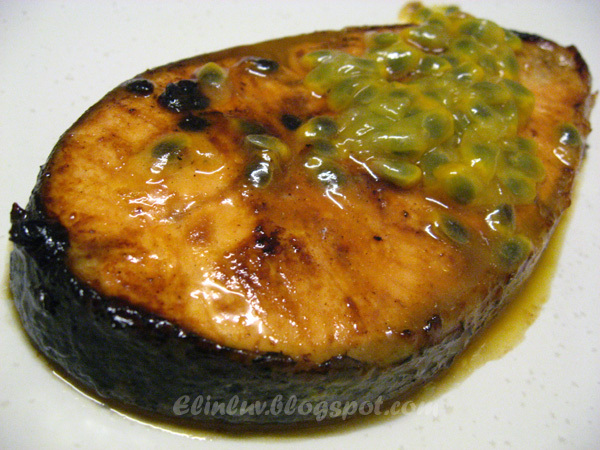 Press the passion fruit pulps through a sieve , take the juice and marinate the salmon steak for 1/2 hour . Shake some sea salt on the salmon steak and pan grilled it with grapeseed oil for 5 -7 minutes on each sides, depending how rare or cooked you ant it to be. Drizzle some white wine vinegar on it before taking it out of the pan grill. Scoop the fresh passion fruits pulps and seeds onto the surface of the salmon steak as topping. This is so delicious! Good for those who want to keep fit and stay slim . Fresh passion fruit is high in beta carotene, potassium, and dietary fiber. Passion fruit juice is a good source of ascorbic acid ( Vit C ) and good for people who have high blood pressure . 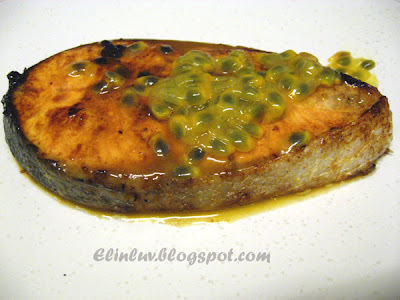 Press 2 passion fruit pulps through a sieve , take the juice and marinate the salmon steak for 1/2 hour . Shake some sea salt on the salmon steak and pan grilled it with grapeseed oil for 5 -7 minutes on each sides, depending how rare or cooked you want it to be. When it is cooked on both sides, drizzle some white wine vinegar on it before taking it out of the pan grill. 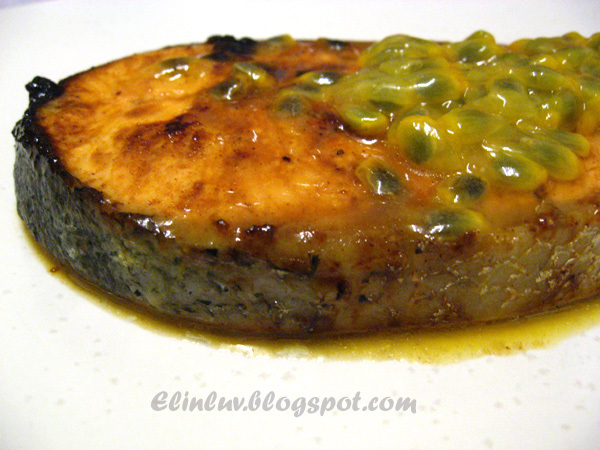 Scoop out the passion fruits pulps and seeds onto the surface of the salmon steak as topping. Serve warm. I wonder how the taste is... sweet and saltish.. i think i like that! Sounds an incredible combo! You've inspired me to give that one a try. Looks amazing. This looks so yummylicious...i wonder if the passionfruits will have same effect on chicken?? 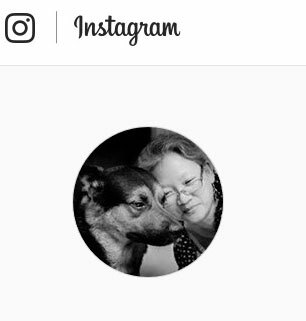 Elin, this is incredible! I really would love to try the combination of passionfruit and salmon! Ooooo...salmon. One thing my daughter misses since she came back home from NZ. I always like passion fruit but can't seems to find it here. I've been looking at every supermarket I went to. I think this fruit goes really well with grill fish. Okay, this looks amazing. A rich piece of salmon with that yummy sauce....man oh man! this is a very special combination, i probably can take 2 fillets with this. do you eat the seeds as well? Let's Go...this sauce is good for fish. I have yet to try it on chicken or other meat :) But this is perfect for seafood . Angie....do try it out. 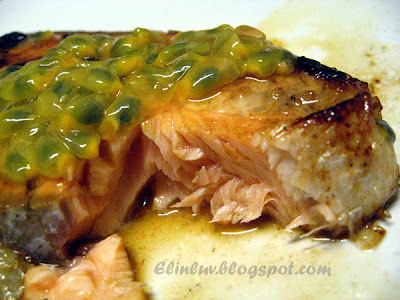 You will like the sweet and tangy flavor of the passion fruits on the salmon. Arthur....make this for Melissa. She will love it ! Gabriel.....no restaurant offers this except Elinluv's Tidbits Corner :p It is my signature dish la :)) Gong Xi Fa Cai to you and family :) Hope you get your promotion soon ...Rabbit Year ! Lena...this sauce is good for the salmon ...you will love it. Me too, I can have two ! Salmon and passionfruit ... what a great idea! I can just imagine the flavors ... the creaminess of the salmon and the tanginess of the fruit. Perfect!